Since getting our new table Mickey and I have been trying to come up with ways to keep it "safe". I know that's not very realistic with three active kids but we're doing our best. We've used kitchen towels for place mats until I bought real place mats. We had a tablecloth on for a little while too. But the thing about both of those is they get dirty after one meal. Did I mention my kids are messy eaters? I was at Kohl's earlier this week and decided to look in their kitchen linens section. I came across something I think will work well, at least as long as they hold up. 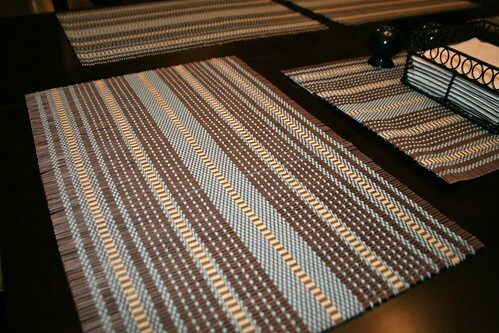 These place mats are made out of bamboo. (They roll up so Kade keeps calling it his treasure map.) So far I've been able to shake or flick off any food that's fallen on them. They go perfectly with the color I'm going to paint the big room. And the best part was they were on sale for 50% off and then a 3 day special of buy one get one half off. That's on top of the sale price! So the first was $2 and the second was $1. I got 8. I probably should have gotten 16 so we could have them a lot longer.